Every day the world is becoming more connected – and mobile devices play a huge part in this realisation. A recent study by independent research company Firefish found that the average person checks their gadget for an average of two hours and 12 minutes every day – checking their smartphone, laptop or tablet 34 times over a 24-hour period. As a modern dental practice it’s so important to keep on top of the latest trends and this is certainly one that doesn’t look like going away anytime soon. In fact, if anything it’s only going to get bigger – so now is an ideal time to take advantage by getting your own dental app with Designer Dental. Remember, you’re certainly not just getting an app because its the fashionable thing to do right now – having your own dental app for patients to download can be highly useful. Let’s start with possibly the most obvious plus point – online bookings. Through your app, patients can check your availability and book appointments 24 hours a day, seven days a week – meaning any gaps in the diary can be easily filled at the last minute, maximising your time. Then there’s the fact your practice’s basic information is there at the app user’s fingertips. For example, there’ll be no more getting lost on the way to an appointment thanks to GPS tracking to let users know how far away they are and if they do have to call you to tell you they’re running late, they can do so with the push of a button. Both for you as a dental professional to manage and for patients to use. You can be up and running within just ten minutes and with no IT integration or complex booking systems you only need a basic knowledge of computers to understand what you need to do to reap the rewards. As your patients stay connected, so do you. With appointments being booked in real-time, you’ll be kept up-to-date with notifications to let you know what’s happening. SMS text dialogue with patients is also a real possibility to allow you to communicate clearly – an important part of maintaining a healthy relationship. Part of the beauty of having your own app is that – at prices starting from £47.50 per month excluding VAT – it can pay for itself with just one appointment booking. The fact that patients can now book appointments to see you with such ease and convenience to them naturally means you are likely to see more bookings coming in. 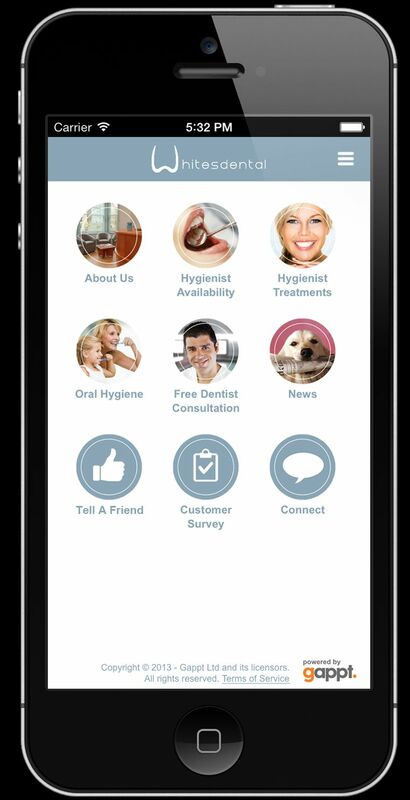 Equally, your app can give you the edge over dental practices which have yet to embrace this technology – potentially resulting in new patients who have heard about your app after friends recommended it to them. Of course, you don’t have to come up with all of the ideas yourself – that’s what we’re here for. At Designer Dental we have 15 years of experience in helping dental practices maximise their potential and know how to get the best out of each and every one of our range of products and services to cater for your needs.